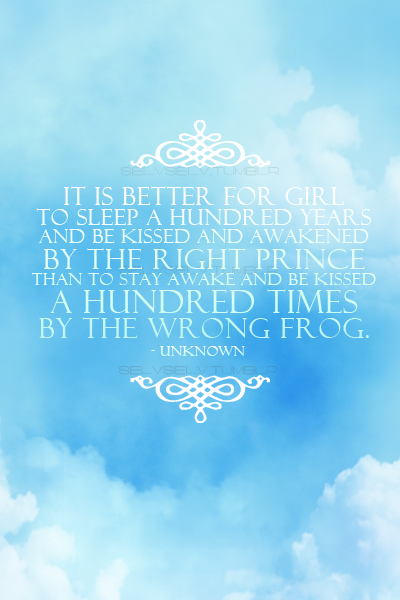 It is better for a girl to sleep a hundred years and be kissed and awakened by the right prince than to stay awake and be kissed a hundred times by the wrong frog. Choosing the right person for you isn't just about the way a person looks physically, but it is about their mental and spiritual characteristics as well, if not more. People tend to jump into a relationship too fast just because a person may look a certain way, or because a person may be financially stable, and learn quickly that this person may not necessarily be the right person for them. Choosing the right person is nowhere near an easy task to accomplish but it can be done. In order to make sure the person you are with is the right person for you make sure that first of all the person is on the same level as you spiritually. A spiritual connection is one of the deepest bonds you may share with someone and without it it may be very difficult to overcome hard times together. Also make sure that the person you are with is happy with who you are, and isn't trying to change you. If the person you are with is trying to turn you into someone else, then in most cases they just need to be with someone else more in tune with their desires. Also look for someone who is going to stay by your side no matter what, a person that doesn't have your back in minor situations probably won't in major situations.